Created 4 Creativity : Happy Fall! I hope I didn't shock your eyeballs too much with all this brightness! I discovered this leaf background stamp from Craftin' Desert Divas and had to buy it. I knew it could become a rainbow of leaves and I just needed to try to make that happen. I heat embossed the background in black and then used Copic markers to color everything in. 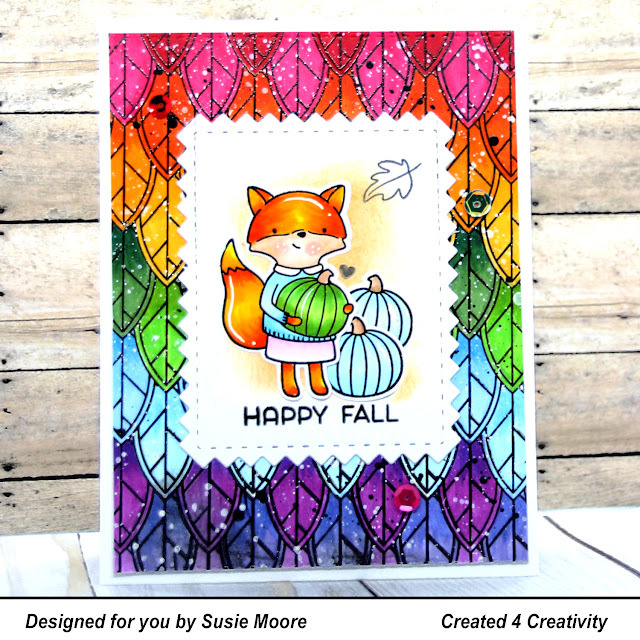 I wasn't sure how I would use this background until I found this sweet little fox that I had already colored and die cut. I just love how the colors work together! The fox and the sentiment are from Hello Bluebird. I have colored all the images from the set already, so look for more of these cuties very soon on different cards!